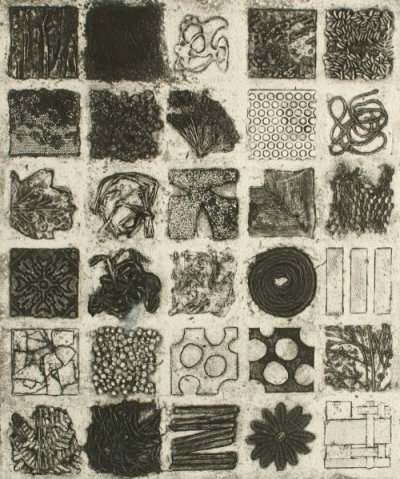 The term PRINTMAKING encompasses a number of different techniques. I am only going to touch upon those that I have used to create the images on this site. The majority of techniques use a plate or a block from which to print the images. These plates are made from different materials according to the process used. Ink is applied to the plate, which is then passed through a press with a sheet of paper. Alternatively, the back of the paper can be burnished - or rubbed - in order to transfer the image. The final image produced is therefore the reverse of the plate image. Inking can either be relief or intaglio (or both). A relief print is made by inking and printing the surface of the plate; an intaglio print is made by inking the recessed areas and lines below the surface of the plate. 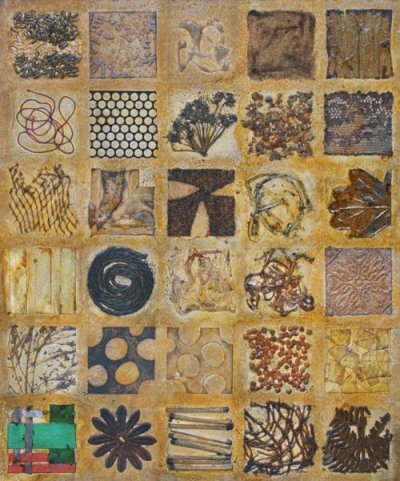 These are essentially prints made from a collage, where different materials are glued on to a backing plate. I use cardboard, which can also be cut into with a knife to give a linear effect and ‘peeled’ to give different tonal areas. The only real limit on what materials can be used is their thickness; if they are too thick, they will tear the paper and potentially ruin the blankets of the press. Once the plate is completed, it is sealed with varnish. Collagraphs lend themselves to being inked by either or both of the printmaking methods above. Please see the examples below for the corresponding results. An embossment is where a textured or layered plate is passed through a press with dry or slightly damp paper. The result is a raised impression. A blind embossment is where no ink has been applied to the plate. To produce an etching, lines, textures and tonal areas are bitten into a metal plate using acid. The surface of the plate is covered with an acid-resistant layer which is then worked into in order to expose the metal to the acid. The resulting marks hold ink during the printing process. Etching is therefore primarily an intaglio printmaking technique but all or part of the surface of the plate can also be inked with a roller if required. 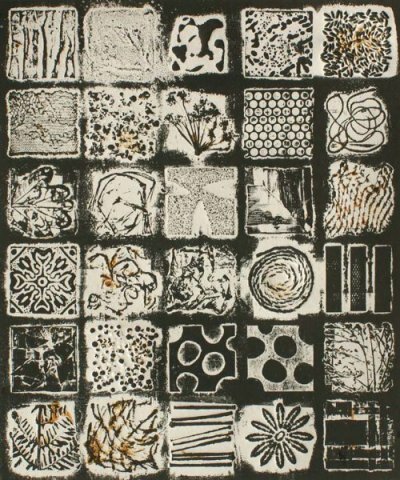 Lino cutting is a relief printmaking technique. Lines or areas are cut away from the linoleum block and the remaining surface is inked with a roller. Multi-coloured images can be produced by using a separate block for each colour or by using the reduction method on a single block. With this method, you start by cutting away any areas that are to remain the colour of the paper (or a pre-applied layer of colour), then ink the block and print the first colour. More of the lino is then cut away before application of the second colour. This process is continued until the required result is achieved. There is often very little of the original block left at this stage. Picasso is said to have devised this method. A monoprint is a one-off print where the image is applied to a host plate and then transferred to the paper. The plate can be rolled with ink and areas masked off or preserved with textured or opaque materials. Marks can also be applied using painting and drawing techniques. The final image can either be created in one pass through the press or it can be built up in multiple layers. A screen print is produced using a mesh stretched over a frame. Areas of the fabric are blocked out using a filler or paper stencils. Ink is then pushed through the open areas of the mesh using a ‘squeegee’ in order to produce an image on the paper below. Images are not reversed in this process, the screen taking the place of a printing plate.